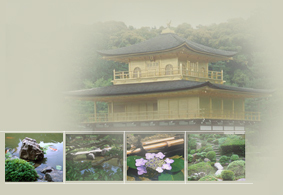 Welcome to the Bowdoin College web site on Japanese gardens, updated on August 27, 2008. We have added a large new section on the individual elements of a Japanese garden, and have updated the bibliography and the section on internet links. For users familiar with the earlier site, this updated version contains the original texts and images together with five additional gardens, bringing the total to twenty-nine. The web site is dedicated to the gardens of Japan, and primarily to the historic gardens of Kyoto and its environs, including Nara. In this updated version, we have also included the Kenroku-en in Kanazawa as an example of the ambitious designs of the Tokugawa daimyo. Although many of these gardens are located within Zen Buddhist monasteries, this site is not intended to explore the influence of Zen thought on Japanese garden design, an influence that is often a matter of conjecture rather than historical evidence. Instead, the site is designed simply to provide the visitor with an opportunity to visit each garden, to move through or around it, to experience it through the medium of high-quality color images, and to learn something of its history. The presentation of each garden will include a plan that will help the visitor locate the various positions from which photographs were taken, but one may also take the tour by simply clicking on Tour the Garden. Other buttons lead to a longer history of each garden, a general bibliography, a glossary, an overview of the history of early garden design, and a section on the basic elements of Japanese gardens. We have also included links to some of the more reputable web sites that deal with this topic. We welcome visitors' responses to the site: simply click on "comments" at the top of this screen, or write me at colds@bowdoin.edu. Educators who wish to use all or parts of this site in their teaching or research may do so, but no part of the site may be used for commercial purposes. New features: re-designed garden pages, new links and bibliographical references, and a major new section on the elements of Japanese Gardens. Flash Player is required. Download the latest version here. If you need help negotiating any section of web site, click here or the help button at the top of the screen.